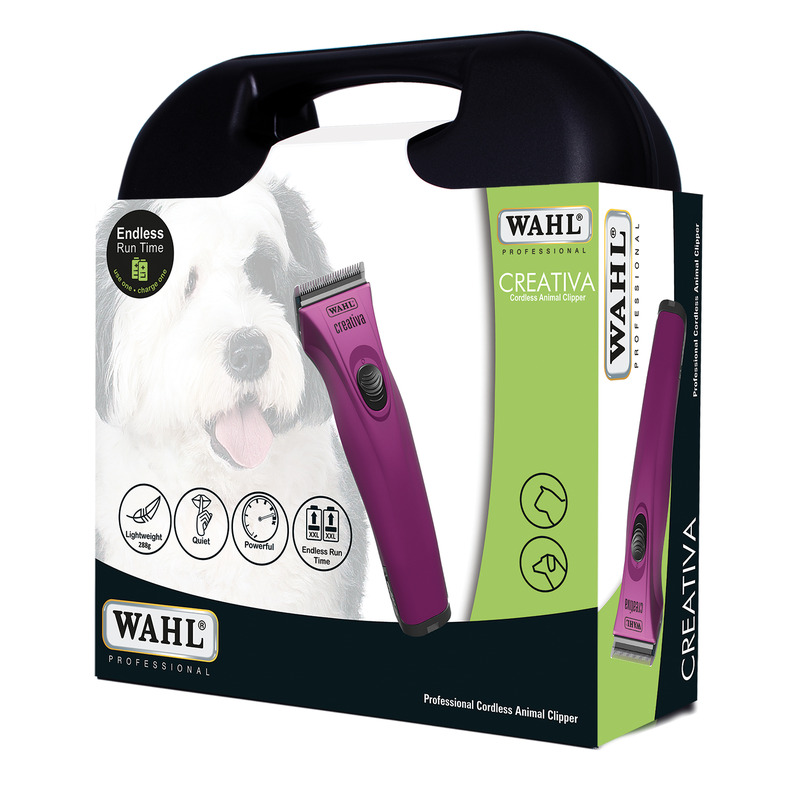 The Creativa Clipper from Wahl is an lightweight, ergonomic clipper/trimmer that uses the same blade as the Arco or Bravura, however, has much improved ergonomics and battery system. It is supplied with 2 high capacity batteries that give a run time of 180 minutes each and a recharge time of 120 minutes. Giving a total run time of up to 360 minutes before charging is required, or potentially endless run time provided one battery is charging while the other is in use. 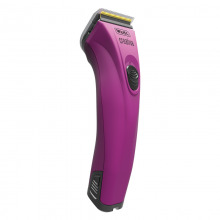 Designed for full body clipping on small dogs or cats and detail work on all dog sizes. - In the grooming salon, the ergonomic lightweight design reduces wrist fatigue, this along with it being cordless allows easy maneuverability around the animal; being worked on. 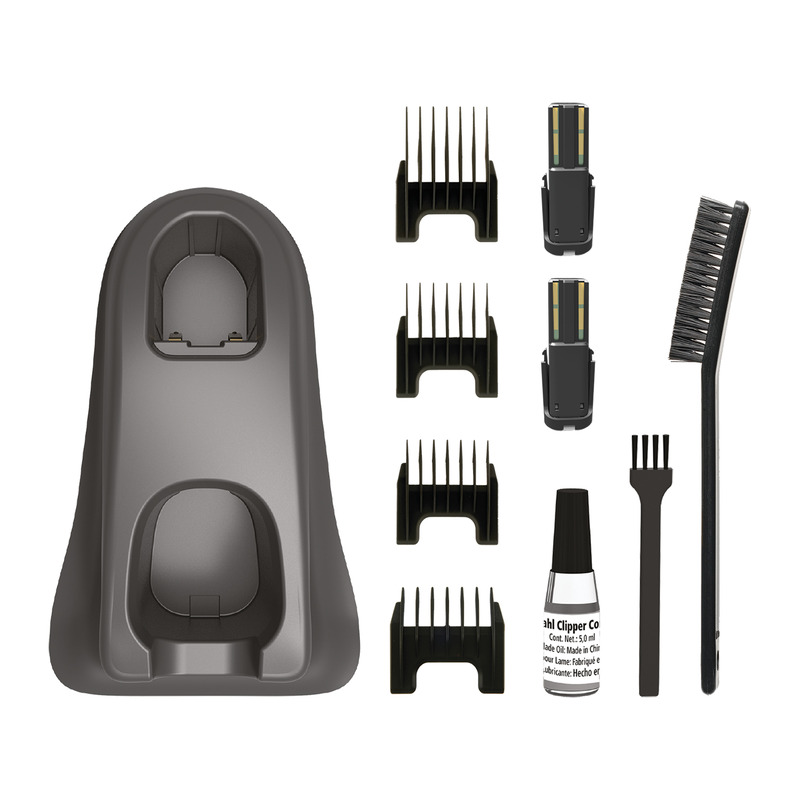 - For showing or grooming competitions, as well as the convenience of the up to 360 minutes of mains use, the supplied combs or the addition of the Wahl Stainless Steel 5 in 1 comb set (available separately), give a wide range of cutting lengths for most situations. The maneuverability also helping with more intricate work. - For the Pet owner, this machine is probably more than required, however, if a lightweight flexible machine is required, either for one animal, in place of a larger more cumbersome clipper. Or for clipping multiple pets, this would be a great tool to have. With the cordless facility allowing clipping to be done away from the mains where the mess from clipped dog hair may be less of a problem. The Wahl brand one of the worlds top clipper brands with 100 years experience in clipping machines, which shows through with this machine. As well as the improved battery system, this machine has a variety of features that make it standout from the crowd. Automatic speed control, that ensures a powerful drive and constant power level, regardless of the type of coat. The motor is sound proofed and produces minimal vibration producing 5300rpm in a clipper weighing just 288g. Along with an LED charge indicator that shows when the battery should be swapped for the charged one. The quick release blade adjust from 0.7mm to 3mm with the supplies combs providing longer cutting lengths. All in all a great addition to the Wahl range that provides a flexible option for a lightweight clipper or trimmer to groomers or other users. -Cordless - Supplied with 2 XXL battery packs offering 360 minutes run time (each battery = 180 minutes) as well as 120 minutes quick charge. - Precision Ground Blades - High precision blade grinding technology, ensuring the best cutting performance for you. Our blades offer superior performance, the finer the teeth the finer the quality.